Don’t get me wrong: I love consoles. And I think my collection of them over the years could prove that point as I’ve owned nearly every one that’s been released in my twenty some-odd years. However, as anyone who games knows full well, there are the inevitable dry spells that arise and cause you to think twice about that massive price-tag associated with your latest console. Did I really need to spend $400 on that Xbox One, you think to yourself, bemoaning the loss of a chunk of your checking account. OK, I’m being dramatic, but those dry spells are serious business and can often lead to frustration for console lovers. To that, however, I say one thing: Why haven’t you tried mobile gaming yet? If you own a smartphone, chances are you’ll already playing on the go but just may not truly realize it. You fire up Angry Birds or something similarly mind-numbing from time to time, but you fail to label yourself as someone who’s into mobile gaming. But why? Did you get burnt out on Game Boy as a kid? Did that Game Gear purchase cause you to rethink everything? Too bad, because mobile gaming is here to stay whether you like it or not. Now let’s start with the obvious leader of the pack: The Nintendo 3DS. Let’s look at one of the biggest stats supporting the success of this handheld system: Its overall game sales increased 45 percent in 2013 and lifetime sales of the 3DS, 3DS XL, and 2DS topped 11 million this past January, according to Polygon. There are many great reasons for those numbers looking so good, such as the fact that the competition isn’t really much of a competition at all and some truly great titles finally arrived on the 3DS. In terms of the latter, Kotaku has a killer rundown of the best games on the handheld including The Legend of Zelda: A Link Between Worlds and Mario Kart 7, among others. The thing is, this is all to be expected, right? Nintendo has long been the ruler of the handhelds while everyone else who’s tried has fell flat on their faces or come so close that they looked ready to succeed … only to fail. We might not be there just yet with Sony’s machine, the PS Vita, but anyone who follows that handheld knows that it feels like the company has all but abandoned it. And judging by the recent news, that sentiment could very well be the truth. Gamespot reported that Sony sees the Vita as a AAA device in Japan only, basically leaving Western users in the dust. Truth be told, there are some great Vita titles out there, including Gravity Rush and Guacamelee!, but are they worth a purchase when Sony’s bailing? That one is up to you. Personally, I’ve only messed around with the Vita a few times and actually enjoyed it. However, the lack of confidence on Sony’s part makes me wary about buying one of these handhelds. Now we get to smartphones, where gaming is better than it’s ever been. I’m not a proponent of the ideology that smartphones could ever trump the experiences of handhelds by monoliths like Nintendo and Sony. However, they do provide the chance to play a ton of games at a fraction of the price without doing more than tapping a few times on the device you’re probably already looking at. Not only that, but a lot of old-school titles (or at least knockoffs of them) are making their way to smartphones. Those include the earlier Final Fantasy installments and any one of the many Legend of Zelda-clones (like Sacred Odyssey: Rise Of Ayden). And if you’re tired of said game? Just hit the home button and take care of whatever you were doing later, because you don’t really have to worry about “saving” and memory usage aside from downloading the barebones stuff. You see, pretty much everything that you do resides in the cloud, a fact made clear in a great post over at Verizon Wireless on the subject. Cloud gaming also allows you to starting playing a title on one device (your PC or iPad) and continue playing on your smartphone when you leave to do something else, like your commute to work. The only problem here, however, is it requires an Internet connection of some sort, which leaves you screwed on an airplane with no WiFi. 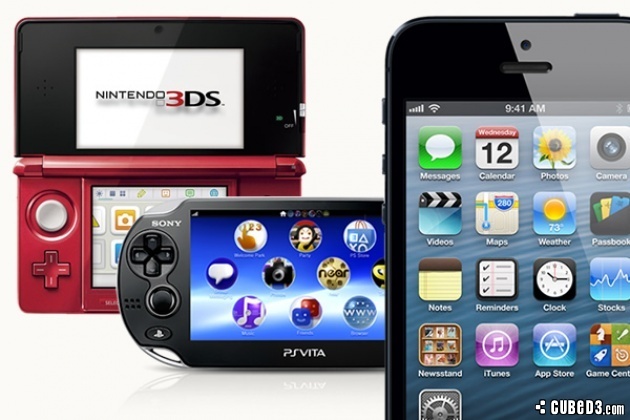 So, when it’s all said and done, who wins this battle of the handheld? I’ll keep it short and sweet: The 3DS is definitely winning right now, but let it be known that you should never count out smartphone gaming.